The Chennai Super Kings are coming off their first loss of the season against the Mumbai Indians. Apart from this the loss of Dwayne Bravo will hurt them as he was their number one death bowling option. Hence they will look at a new combination without Bravo and will particularly miss his expertise when they travel outside Chennai. The Kings XI Punjab on the other hand will be very positive after pulling off a miracle against the Delhi Capitals where they stole the game from them picking up 7 wickets for just 8 runs towards the end. They will also be confident playing at Chennai with the quality they have in their spin attack as well as the captains understanding of this ground. 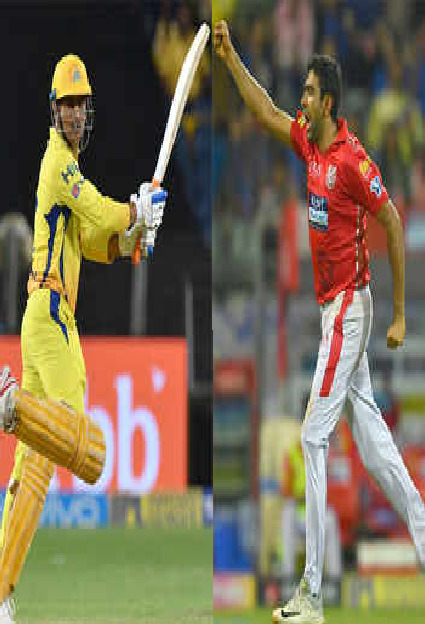 Out of the 20 matches played between the two teams, the Chennai Super Kings have won 12 matches and the Kings XI Punjab have won 8. At Chennai, the Super Kings have won 3 out of the 5 games played. Suresh Raina, for the Chennai Super Kings, has been getting good starts in every game but has not managed to convert those starts. The Super Kings desperately need him to come good to stop the top order collapses and get a big score. Raina has always been a good player of spin and on this pitch, he should be most comfortable taking on the spin attack from the Kings XI Punjab. R Ashwin, for the Kings XI Punjab, will be playing his first IPL game at Chennai since moving to Punjab. He bowled very well in the game against the Delhi Capitals and will be itching to bowl on the Chepauk pitch. Being the second highest wicket taker at Chepauk with 43 wickets in 37 IPL matches, R Ashwin will be critical to Kings XI Punjab's success. The Chennai Super Kings will have to make changes due to the injury of Dwayne Bravo. One of Scott Kuggeleijn or Santner is expected to replace him. Harbhajan Singh can also expect to get back into the side for this match. With Chris Gayle fit, the Kings XI Punjab will look to get him back into the side. Considering the pitch at Chennai, Hardus Viljoen is expected to make way after Sam Currans match winning performance against the Delhi Capitals. The pitch at Chennai is expected to be dry and will help the spinners. With it being an afternoon game, the dew is not expected to be a factor and hence the batsman will have to work hard for their runs. Playing at home, Chennai Super Kings will definitely start as favorites. Having said that, the Chennai Super Kings have struggled at the top of the order and Bravo’s injury means they will be short in the death bowling department. To go with this, the Kings XI Punjab have 3 quality spinners in their line up including 2 spinners (R Ashwin and M Ashwin) from Chennai. Hence with good spinners and likes of Rahul, Gayle and Agarwal in good form at the top, Punjab will fancy their chances as well. The Chennai Super Kings should look to open the bowling with Harbhajan Singh who has troubled Gayle in the past. KL Rahul is a free flowing batsman and taking the pace off the ball with cutters and slower balls on the Chennai pitch will trouble him. The Kings XI Punjab should look to open the bowling with R Ashwin who has had success against both Watson and Rayudu in the past. Spinners against Dhoni will also be a stratergy to tie him down with dot balls.